It was again time to go to London for the Young Adult Literature Convention, my bookish highlight of the year. I don’t know where to begin. Maybe with the journey to London? On thursday, 26th July, I took the (delayed) train to Stuttgart. Of course, my plane was delayed as well. It was hot and I could feel my headache growing with each minute. Then finally, almost two hours and an exchanged plane tire later, the flight to Berlin began. I flew over the beautiful city of Leipzig and got super excited for a second because I could see my house. Then in Berlin, I had two hours for chilling at the airport and since the terminal was under construction, there was constant hammering. And just like that, the headache got worse. Urgh. Anyways, I finally made it to London and into the underground and reached King’s Cross, where I met with Abbie (boneseasonofglass). We went to our hotel, where we just slept and went to sleep quite early. Abbie and I got up early because we were not sure how long the queue would be and because there were signings to go and stands to check out. Turns out, the queue wasn’t long and we got in pretty quickly, the excitement growing with every step. First, we checked out all the different stands and publishers and immediately bought our first books. 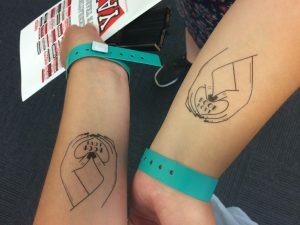 I went to four signings, which was a bit exhausting since it involved a lot of standing in line in the heat. Because yes, it was really hot. Good I brought a fan. But I got books signed! First, I met Sally Green. I’ve loved her books ever since I read Half Bad about 3 years ago. I then went to the signing of Chloe Seager, who is one of the nicest people ever. And I was so happy she recognized me from the internet. Also, Editing Emma is hilarious and fun and very real and I love this book. Then Abbie and I met up again to get in queue for Alice Oseman, one of my all time favourite authors. 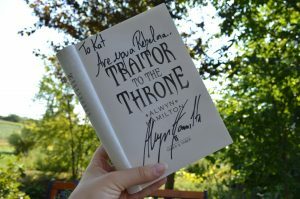 The last signing for this day was Alwyn Hamilton, which was especially amazing since I am currently reading Traitor to the Throne. She was so nice as well and can we please just take a second to appreciate her wardrobe? Because I love everything about it. The rest of the day was just looking around, sitting around and snagging some goodies and ARCS before taking the bus back to food and the hotel. We decided to get up later. Mostly, because we were tired. We got there a bit later and had another look around before we went to queue for Tomi Adeyemi’s signing. We were lucky we went there early, because the queue was HUGE. And meeting Tomi was probably one of my highlights of the weekend because honestly? Tomi is a ray of sunshine and genuinely so positive and lovely! Right after, we went to see Samantha Shannon, whose queue was extremely long as well. We had another look around before we went to the Loud & Proud panel, that was funny for one thing, but also very real and honest. I would very much love to read all the books by all the authors now. The last thing we did on Saturday, was attending the YALC quiz, where two teams of authors competed against each other. One of the teams called themselves Team Momoa (because Jason Momoa walked through YALC several times on that day. he was the Benedict Cumberbatch of 2018) and when there was a quick fire round and each team had to decide on a buzzer sound, team Momoa chose „Aquaman!“ And of course, there was one question where the whole team suddenly shouted „AQUAMAN!“ right when the door opened and Jason Momoa walked in and was like ??????. He has been summoned and it was a ridiculously perfect moment. What even did we do on this day? We got there quite late, too late in fact, to join any of the workshops we wanted to do. So instead, we walked around and talked to people and sat around, being exhausted from the previous days. 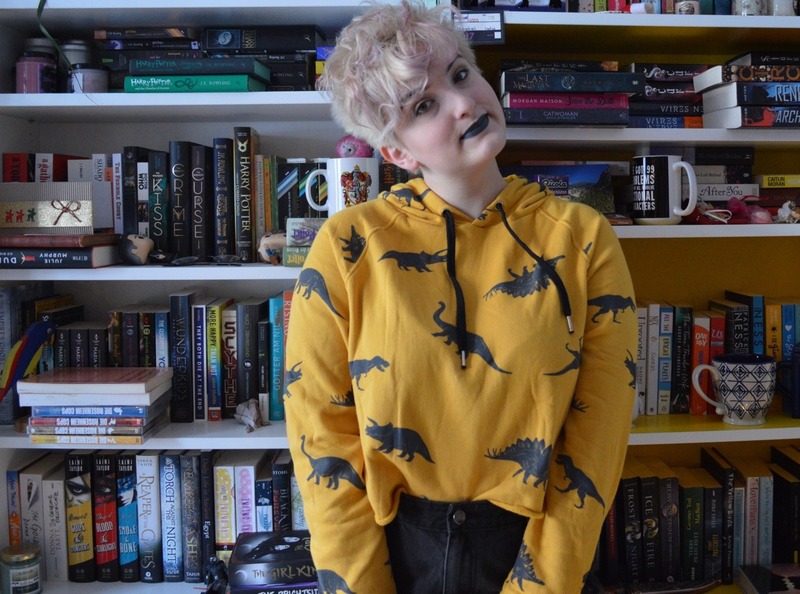 We went to the ‚Real world, real me‘ panel, where the authors talked about physical & mental illnesses and about the darker themes their books are about and how they deal with it. This panel was very interesting. After this, we each went to different signings. I went to meet Akemi Dawn Bowman, author of Starfish. She was so nice and it was amazing to see her. I’m really excited to read Summer Bird Blue, her next book. 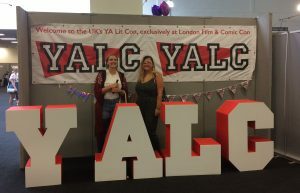 We also went downstairs to Comic Con, but only for half an hour to have a look around, before the craving for the peace and quiet of YALC came upon us and we gladly returned to the YALC floor. We did not do much afterwards. More walking and talking to people, more walking around and, of course, more book buying. The publishers just had the most amazing deals that we were unable to resist. I now own 17 new books. I met Abbie again (finally!!) made new friends and got some amazing stuff. Everything about this weekend was amazing and wonderful and I’m definitely going back next year! Though the journey back was meh as well and I’m going to take the train. And you guys… I have a serious case of YALC hangover. 10/10 would recommend going there. I have to admit: I am a little bit jealous. Okay, not a little bit but A LOT. This sounds like to much fun ♥ And it’s so much more tempting than the LBM or FBM. I would really love to go there someday. I am happy for your that you had so much fun. it was! It definitely was! 🙂 To be honest, it is also much better than both FBM and LBM. While I love these two as well, YALC is just better. And yup, Jason Momoa was amazing! And Iwan Rheon and Peter Capaldi visited the floor as well haha.